Bay Area S2ki Showoff: Hanzel Tango’s 無限 S2000 – MoMoHitsTheSpot! Subtle, unique….. exceptional. These are three words that comes to mind when I’m trying to describe this immaculate 無限 S2000. Of course if you’re in the show scene or frequent the S2000 forums, chances are you’ve seen this S2k yourself and had some contact with its owner, Hanzel Tango. Hanzel has been hitting the show scene pretty frequently the past year or so, and well he should! Cause his car is literally thousands of S2000 owners’ dream. This car is literally oozing Mugen products inside and out from the S1-R buckets to the full SS exterior and even the engine bay essentials. Just Mugen Mugen Mugen! But taking a step back from the car for a second, I just wanted to take the time to say thanks to Hanzel for putting together this event for the Bay Area S2k guys and even went out of his way to make a few trophies to make this meet really special. It’s really rare these days to see a guy who owns such an amazingly built car and yet, is truly down-to-earth and genuinely humble. A lot of times I feel like guys that are internet famous or knows they have nice builds are snobby and unapproachable, and I’m definitely not about that. So I salute you my friend! But back to the car……. 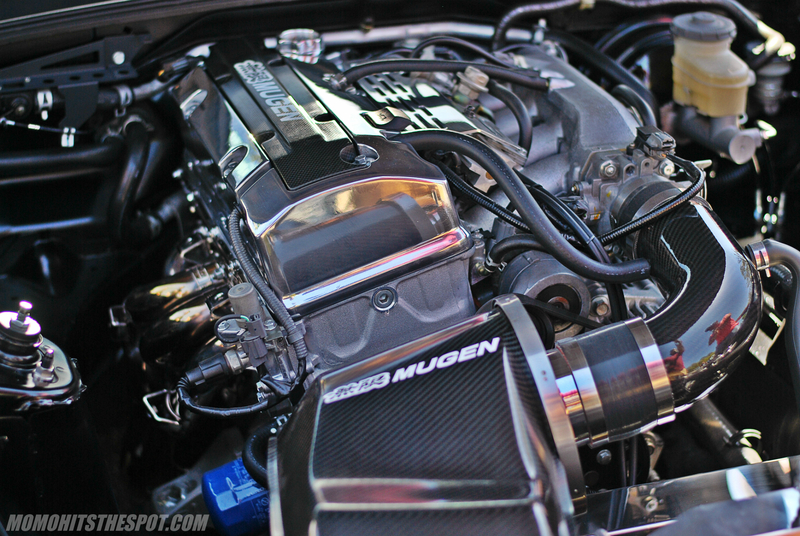 literally Mugen everything. I got to chat with Hanzel for a bit at the meet and there’s a few details that really makes this car stand out from other Mugen builds. First, he’s got NSX-spec rear MF10s all around the car; essentially a non-staggered setup. Next, the tucked engine bay. And lastly, widen OEM front fenders that makes the MF10s fit perfectly. It’s details like these that sets the “greats” apart from the rest. Stay tuned for more from the rest of the meet! Bay Area S2ki Showoff: Rio Nice!